Grease bottom and sides of square pan, 9x9x2 inches, with butter, or line with aluminum foil. Heat chocolate chips, marshmallows and milk in 2-quart saucepan over medium heat, stirring constantly, until chips and marshmallows are melted and mixture is smooth. Stir in vanilla, nuts and cherries. Immediately pour into pan. Drizzle with melted white baking chips. Cover and refrigerate about 2 hours or until firm. Cut into 1-inch squares. Microwave Directions: Place chocolate chips, marshmallows and milk in 8-cup microwavable measure. Microwave uncovered on High 3 to 5 minutes, stirring every minute, until chips and marshmallows are melted and mixture can be stirred smooth. Continue as directed in step 3. 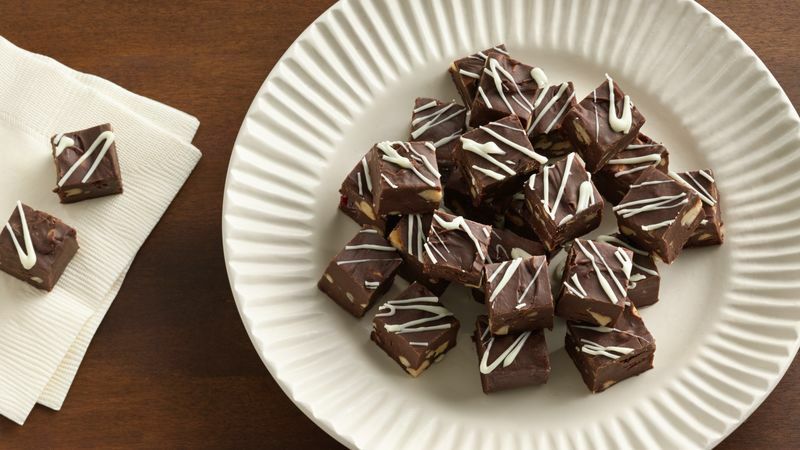 If you're a lover of lusciously smooth and creamy chocolate fudge, just leave out the nuts and cherries.